It’s that time of year, time for me to dust off my Irish genes—which are mingled with Scottish, a bit of Cherokee Indian, as well as a few others that I’m not sure about—and enjoy a bit of my family heritage. We’ll have some Irish stew, Irish soda bread, and at least one dessert with some of our favorite Irish flavors: Irish cream and Guinness. I was in my 30s when I had my first taste of Irish cream, and since then it has become a staple in our bar. 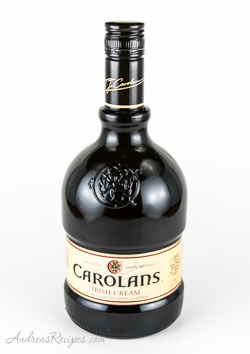 I’ve tried just about every brand of Irish cream I’ve come across, and my personal favorite is Carolans. Though Baileys still holds the number one spot in terms of worldwide sales, Carolans is the number two seller and costs substantially less. The texture is a little lighter than Baileys, but still very smooth and creamy, and I like the honey flavor in it. The flavor of the Irish cream is subtle in the cake and a little more pronounced in the glaze, just enough to let you know it’s there but not overwhelming. The pistachios are optional, but I like the spark of green color they add. Makes 1 10-inch tube can or 2 9×5 loaf cakes. 1. CAKE: Set oven rack in the middle and preheat oven to 325° F/165° C.
2. In the bowl of the stand mixer, cream together the butter and the cream cheese. Add the sugar a little at a time, mixing on medium speed until light and fluffy. 3. Add the eggs, one at a time, mixing on low just until the yolk is no longer visible. Don’t overmix. 4. In the medium bowl, sift together the flour and the salt. Add 1/3 of the flour and salt to the butter mixture and mix on low just until blended. Add the vanilla and 1/2 the Irish cream and mix in, then 1/3 of the flour and mix, the remaining Irish cream, and finally the rest of the flour. Be gentle. Don’t over mix, or the cake will be tough and lose volume. You can also do this part by hand using a spatula to fold in the flour and Irish cream. 5. Gently fold in the pistachios. 6. Pour into the prepared tube/loaf pan(s) and smooth the top of the batter with a spatula. Bake for 1 hour 15 minutes to 1 hour 45 minutes depending on the cake pan, using a long bamboo skewer to test doneness. Skewer should come out dry, but may have a few crumbs clinging. Remove from oven and cool in the pan on a wire rack for 15 minutes. Remove from pan and cool completely on the wire rack. 7. GLAZE: In the small bowl, whisk together the confectioners sugar and the Irish cream. Add a little milk at a time, adding just enough to make the glaze easy to pour. Drizzle over the cake and allow to rest a few minutes, then serve. That cake must be delicious! 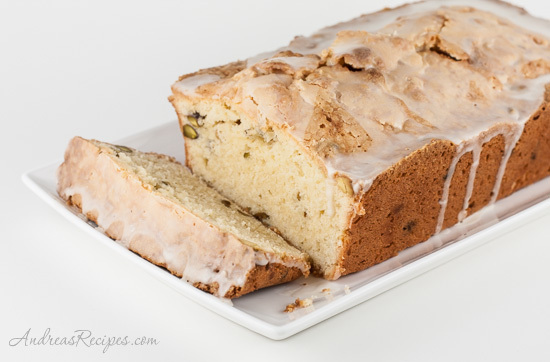 Irish cream pound cake sounds wonderful! I will make it for Easter, since I missed St Pat’s day and will offer it to my Irish neighbor Mary! 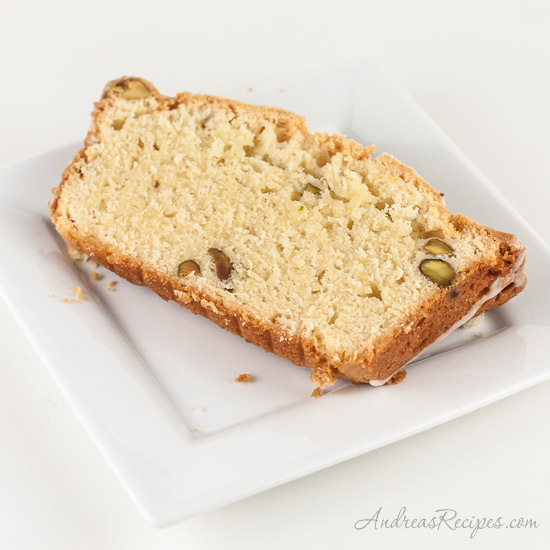 This pound cake recipe was delicious! I had a taste straight from the Chef! I love baking with irish creme. It adds this amazing flavor to everything. This pound cake looks delicious! I love that you added pistachios in as well. I’m not sure that I have ever had Irish Cream, but it sounds like a divine combination for pound cake! This looks great, being in Hawaii, I’ve got to wonder how this would taste with macadamia nuts.